The play begins as soon as you enter the space; a buzz of anticipation surrounds me. Frantic Assembly is renowned which is a blessing, but also a curse. There’s an expectation to be exceptional and I can only feel nervous for the actors about to perform. 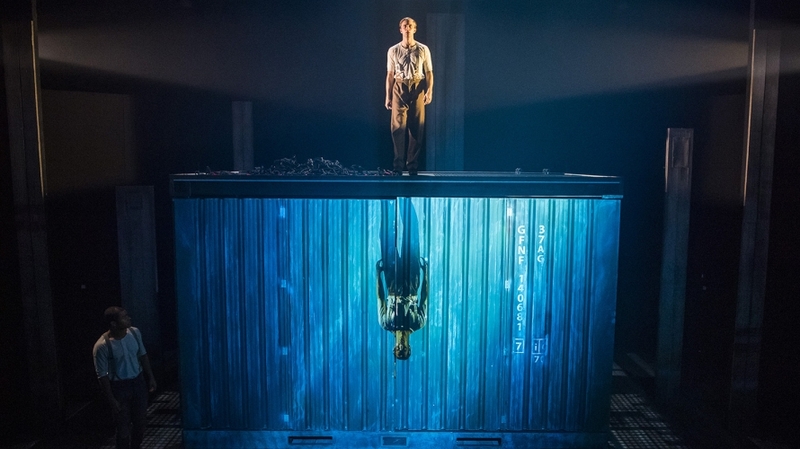 A rough sea is projected onto the crammed stage: a cargo crate centrally placed. Honestly (for whatever reason), I really had a sense of fear. The ominous soundtrack, promoting a feeling of melancholy that washes over the audience like the sea washes over the space. I was more than intrigued and could not wait to plunge into this narrative. To break the fourth wall briefly, I couldn’t actually write this review the day of the performance, as I normally do. I was physically so exhausted from the journey I had just stumbled through that I could only collapse as soon as I reached home. Truly I feel the show deserves a health warning or something: WARNING- NOT FOR THE FAINT HEARTED. The sheer intensity of it is enough to leave you sat in your seat for a good ten minutes after the performance, until someone eventually brings you back to reality and you’ve got to awkwardly shuffle out before you’re locked in the theatre. A very simplified way to highlight ‘The Unreturning’ would be: a whirlwind through time, interweaving three stories, three time periods but a shared experience of conflict. It’s just overwhelmingly impressive to witness how slick the actors move; the choreography is stunning. It’s a seamless construction, and as these three characters’ stories are revealed gradually, their links and similarities arise and connect them. The borders of time become hazy and they eventually morph into one being- a victim of war and conflict. The director noted: “the exciting task has been to find a way for all three stories to exist at the same time in the same space”, and I fully believe he has achieved this goal. I LOVED the juxtaposition of the different time periods. The set; a malleable masterpiece perfect for establishing all settings and scenarios, but also an illustrator of how lost these characters were. How they felt like they were floating astray like lost cargo. Equally, this rotating set just made these parallel worlds belong to one another, allowing beautiful transitions into emotionally powerful monologues. I WANT TO KNOW HOW THEY CHANGED COSTUME SO QUICKLY! I understand there were layers at work here and probably some high-quality Velcro, but this rotating cube only gave them limited time between certain movements and character changes. It takes some serious skill to suddenly change a whole character mind-set after investing yourself so deeply in an alternative one. This is already on top of the fantastic physical movements (a signature of Frantic Assembly) and the forever changing set design and lighting. All I can leave you with is that this play presents no resting point, a poignant relevance to the soldiers who must constantly fight. A must watch.